New support cards for the return to Deck strategy of Gear Chronicle. Auto (VC/RC): When this Unit attacks a Vanguard, for every Rear-guard you have than your opponent does, during that battle, this Unit gains Power+2000. Auto GB1: When this card is placed on (RC), during that turn, this Unit gains “Auto (RC): [Place this Unit on the bottom of the Deck] At the end of each turn, you can pay the cost. If you pay it, choose 1 of your opponent’s Grade 1 or higher Rear-guards, your opponent places that Unit on the bottom of their Deck.”. “Steam Fighter, Nagish” is an attacker that gains Power when it attacks the Vanguard and you have more ally Rear-guards than your oppponent! For each Rear-guard you have over your opponent, during that battle, it gains 2000 Power. It requires no Generation Breaks, so you can attack with a ton of Power during the early parts of the game! Because this ability can be used while it’s either on the Vanguard or Rear-guard circle, it’s essentially an all around attacker. The ability of “Rampaging Gear Bar” returns an opponent’s Unit to the bottom of the Deck! At the end of a turn when it appears on a Rear-guard Circle, it can return itself to the bottom of your Deck, then choose 1 of your opponent’s Rear-guards and place it on the bottom of their Deck. Unlike “Steam Knight, Kalibum”, it can reliably place an opponent’s Unit on the bottom of the Deck. 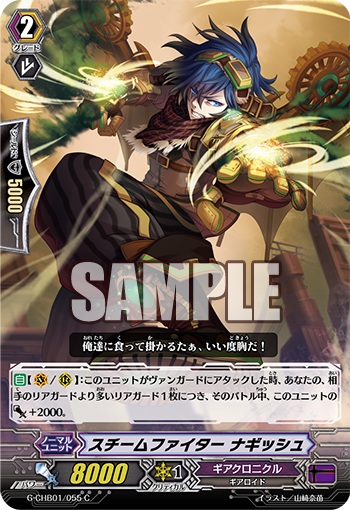 And since “Gear Bear”‘s cost is returning it to the Deck, you can call it multiple times with 【Time Leap】. If you call it with Time Leap, the Card you Bound cannot return, so keep it in mind. Since it returns to the Deck at the end of every turn, even just one copy should be plenty for a Deck. “TRY3 NEXT” is full of cards that power-up 《Gear Chronicle》. It also includes Zodiac Time Beasts, so pay attention to future information!